According to BBC report, about 6 people have now been confirmed dead and at least 48 injured in a terror incident in London in which three male attackers were also shot dead by police. 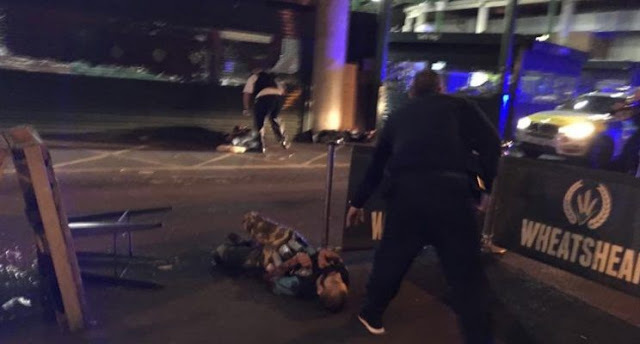 Armed officers shot the suspects within eight minutes of the first call.One picture (above) showed two suspected assailants, one with cannisters strapped to his body, on the ground. The injured were taken to five hospitals. More than 80 medics were sent to the scene. One of the injured is an officer from British Transport Police who was stabbed after responding to the incident. His condition is serious, but not life-threatening. A bomb disposal team was called to Borough Market and local residents told to leave their homes. He said it was currently believed there were only three attackers involved. “We are treating this as a terrorist incident and a full investigation is already under way,” he added.